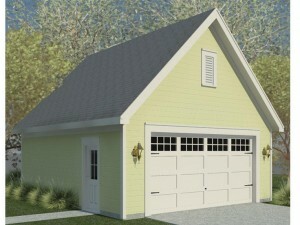 A gable roofline and a siding façade hint at the practicality this 2-car garage plan has to offer. Add sheltered parking or extra storage to your backyard with this handy garage design. Whether you need room for the growing family fleet or extra storage space for basement or attic overflow, you’ll appreciate the 538 square feet of usable space inside. Furthermore, the simple design of this garage allows it to blend well with a variety of architectural styles. Special design elements include a 9’ ceiling and a side-entry service door. Designed to accommodate a broad range of needs, this double garage plan will add value and function to your home. Learn more about this design.